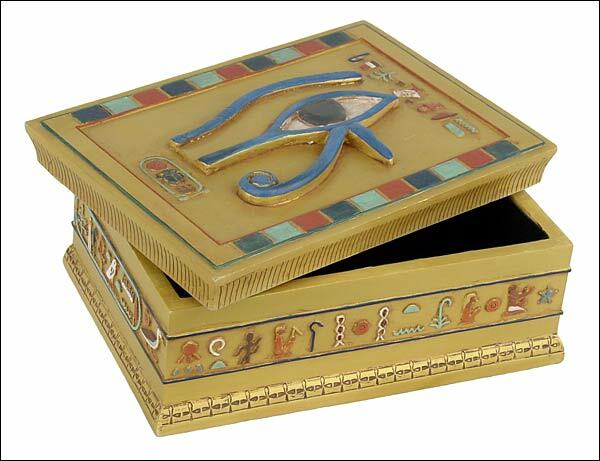 Eye of horus box, eye of horus. The eye of Horus also called Oudjat or Wedjat, is the left lunar eye which originates from the struggle btween Horus and Seth. In this fight, Horus loses his left eye which is taken by Seth, but then Horus acquires spiritual sight, the eye of light. The eye was later healed by Thoth and returned to Horus and then called �the Oudjat� (�the Whole One�). It was a symbol of the power of the God of light, and therefore a popular amulet for protection and good luck. Some oudjat eyes had an arm carrying the Ankh or the papyrus staff, symbol for �to flourish�. The eye of Horus was also used as a protection against the evil eye. From the late old kingdom, two oudjat eyes were placed on the door recesses of tombs.